Are Green Bee’s Program Legal? Yes, Green Bee’s Programs are legal in all 50 states of America. Without question, this is the #1 question that people ask. And we fully understand why, our programs are unique and most people have never seen them. At first glance, people assume this is tied to gambling. Which it absolutely is not. Our programs are no different than the sweepstakes people play at their local grocery store or fast food restaurant. People are purchasing a Savings Club Card and then given a chance to win in the Sweepstakes. How Can These Be Legal? Our programs follow the same laws that govern almost all of the sweepstakes you see today. Once a person purchases an item of value, a merchant can legally provide a free sweepstakes to that person. For example, when a customer purchases an order of McDonald’s french fries, McDonalds is allowed to give them a chance to win in the Monopoly sweepstakes. Green Bee’s Programs are no different. Every program is selling the Saving Club Card and offering the Sweepstakes for free. What is the Savings Club Card? The Savings Club Card offers discounts to a variety of participating businesses. When a supporter purchases a ticket they are buying the Savings Club Card. 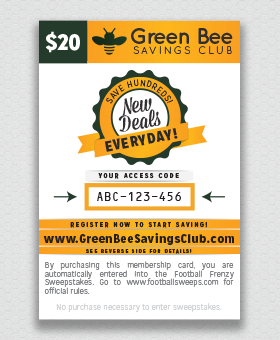 The Sweepstakes can be any of Green Bee’s programs: Football Frenzy, Basketball Slam, etc. There is no gambling involved with the Sweepstakes. These are not games of chance. The ticket combinations are pre-determined and distributed randomly. Nobody has an edge over any other ticket holders. No. Green Bee’s Programs are not raffles. 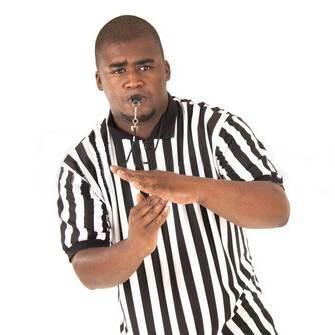 Raffles have a variety of different laws depending on which state the organization is located. Our programs are structured to follow the laws associated with the purchasing of goods and sweepstakes. A Collective is when the prize money is pulled from multiple organizations. This creates 1 large prize sheet with a lot less winners. Green Bee does not offer or support Collectives. We feel that this dramatically impacts the organizations ability to raise money. People will figure out that just a few, or nobody, in their organization won. Ticket sales will suffer in the future because of the lack of winners. We strongly recommend avoiding fundraising companies that offer a Collective prize. Does Green Bee have a Disclaimer? Any reference to the words sell or selling or sales applies only to discount coupons or discount cards or any other services and does not apply to the sweepstakes tickets in order to be eligible for prizes. Sweepstakes are for promotional use only. There is no purchase necessary to be eligible for prizes.